This interactive Bible storybook has been especially created for young, curious minds. With playful art and flaps to lift, children will love discovering the Christmas story for themselves! 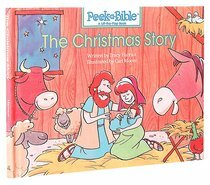 About "The Christmas Story (Peek-a-bible Series)"
The story of Christmas comes to life in this interactive Bible storybook created especially for young, curious minds. Playful art greets children on each page. Lift the flaps to discover what's happening next in the Christmas story. Tracy Harrast is a prolific writer of children's books. She is the author of the Peek-a-Bible series and Picture That! Bible Storybook. She lives with her husband and three children in Alpharetta, Georgia.